What is the Best Pillow for Toddlers? Parents can safely start giving pillows to children who are about two years old, the time when the child is safe to move out of the crib and onto a toddler bed. Remember not to put pillows, thick quilts, or anything of that sort to children younger than the aforementioned age as it might be a suffocation hazard. Also notice if the child’s shoulders are wider than the head. It usually means that it’s the time the child rest his/her head on a pillow for more comfort. You can also observe your toddler when he/she sleeps. The child will usually find comfort himself and will rest on a stuffed animal or blanket. When you believe that your toddler is ready for a pillow, read through this article to find out the best pillow for your toddler. What are the factors to consider when buying a pillow for toddlers? Size: The size of the pillow is one of the first things you should consider when shopping for one. Make sure that it’s just the right size to support the head and neck of your toddler; not too small and not too big. Also take into consideration the bed where the child will be sleeping. The pillow should fit just right in to avoid it from getting thrown off the bed. The thickness of the pillow is another crucial factor to consider when picking the size. The typical ones should be around one to two inch tall, just enough to slightly elevate the head of your toddler without straining the neck. Fill: When choosing the fill of the pillow, make sure that it is hypoallergenic and is made of soft materials that are firm enough to give support, so that the head of your toddler is not sinking into the pillow. A hypoallergenic pillow minimizes allergens so your child will have a deep sleep minus the sneezes. The firmness of the pillow can be determined through the fill. The popular fill for toddler pillows are cluster fiber that is soft enough to give comfort and firm enough not to completely flatten over time. There’s also a memory foam pillow aimed for toddlers that provides head and neck support while aligning the body in a natural position. Avoid feather or down pillows for now because they are too soft for toddler use and they can also contribute to allergies. Material: For additional comfort, pick pillows with materials that are soft and smooth for your toddler’s delicate skin. The best one is 100% soft cotton casing with around 300 and above thread count. Cotton is good for breathability so that there’s still air circulation despite resting on it for hours. There are two types of cotton material to choose from: organic and inorganic. The organic version is more expensive but it doesn’t have any harmful toxins, bleaches, off gassing or dyes. Lastly, pick materials and fills that can be machine-washed and dried. Children can get to all sorts of mess and the bed, beddings, and pillow don’t exempt. Sleeping Position: Evaluating how your child sleeps is very important not only to help you choose the best pillow, but also to thwart them from injuries. If your child is a back sleeper, he/she can go without a pillow until age two. After that, a thin pillow will suffice. Reassess the pillow height as your child grows. If your child is a side sleeper, you need to get them a pillow as soon as they show comfort in lying on their sides, despite not reaching the age of two yet. Get pillow that is slightly thicker from the one meant for stomach sleepers. Stomach sleeping should be avoided. Try to prevent your child from developing the habit of sleeping on his/her stomach as this position can be too taxing to your child’s frail neck. Key Takeaway: When choosing the best pillow for toddlers, make sure that it’s the right height depending on their sleeping position and it is made of materials that are soft and comfortable and at the same time, won’t cause allergies. What are the best pillows for toddlers? Our Fun, Bold Designs Make This the Perfect Pillow for Toddlers, Travel, School, Napping & Reading Support! 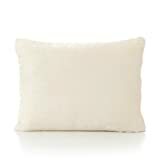 This pillow is made of 100% hypoallergenic cluster fiber housed in 100% soft cotton. It can be machine washed and dried. After washing, easily reshape the pillow by grabbing the corners and fluffing it. This pillow is just the right size for toddlers. What sets this apart from other toddler pillows is the manufacturer’s 90-day money back guarantee if you are not happy with your purchase. It is made of hypoallergenic premium cluster fiber fill housed in a 100% cotton with 200-thread count fabric. This lightweight pillow is recommended for keeping the right body alignment of your toddler. It is designed to be soft yet firm enough to keep the child’s head and spine aligned and it also protects the round shape of the child’s head. The pillow is made of breathable foam to draw away moisture and keep your child’s head cool. 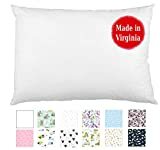 My First Kids Toddler Pillow Premium Memory Foam Toddler Pillow with Pillowcase, Cream, 12" x 16"
This pillow is made of 100% visco elastic memory foam that molds to the natural size of your toddler’s head and neck. The foam and the cover are hypoallergenic, mite-proof, and mildew resistant. Finding the best pillow for toddlers is not as easy as it sounds; you need to consider the height, size, fill, and materials used to ensure that your toddler will get the right pillow suited for his/her small head and frail neck. You want to get something that is not only comfortable but also safe.